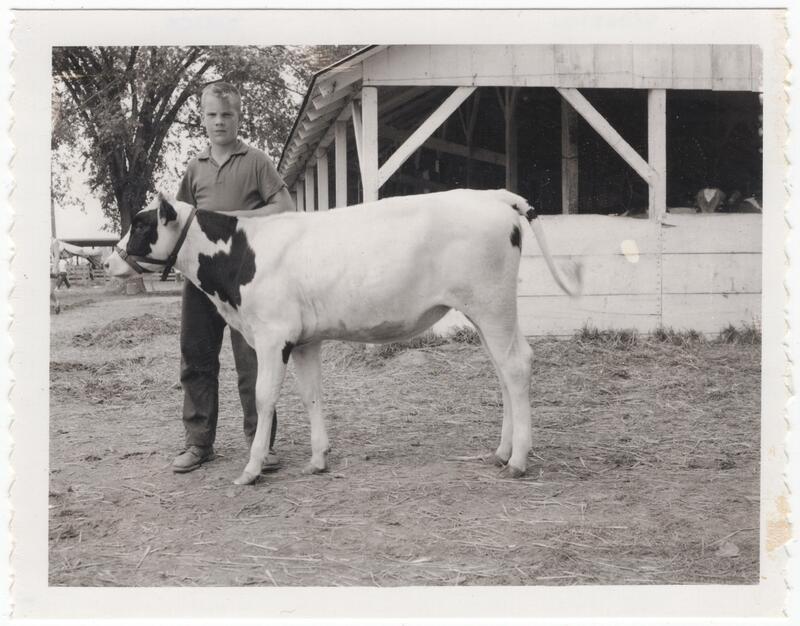 George with his cow at a 4-H show in 1958. One hundred years ago, my great-grandfather Glenn Kaiser wrote a Christmas letter home to his mother. He had just received his Christmas box that his mother sent. Below is a transcription of that Christmas letter. Three out of four main branches of my family tree have very deep roots in Illinois, spanning at least 5 generations. Six out of my eight great-grandparents were born in Illinois, and 12 out of my sixteen great-great-grandparents lived in Illinois during their lifetimes. My 4th great-grandfather Alexander Holbrook was another early Illinois ancestor, arriving in probably about 1828. The 3rd great-grandfather Johann Wilhelm Mueller and his family arrived in Chicago in 1856, 15 years before the Great Chicago Fire. The Drake family has lived in DeKalb County, Illinois for over 150 years (and still lives there today! ), spanning at least seven generations. They had lived in Illinois since about 1845. My Fish ancestors, who married into the Drake family, also arrived in Illinois about 1846. My Swedish ancestors arrived in Illinois a little bit later, starting with the Johnsons in 1870, and Medine family in 1881. One hundred years ago today, the Armistice was signed between the Allies and Germany, which ceased the hostilities on the Western Front, and that ended World War One. When the war ended, my great-grandfather Glenn Kaiser had been serving in the Army for 14 months, and had been on the front lines with the U.S. Army 32nd Division for many of the major military campaigns of the war. He was one of about 1,000 men from DeKalb County, Illinois to enlist in the service, and was one of the 4.7 million American soldiers to serve during the war. He was sent to the European front in February of 1918. 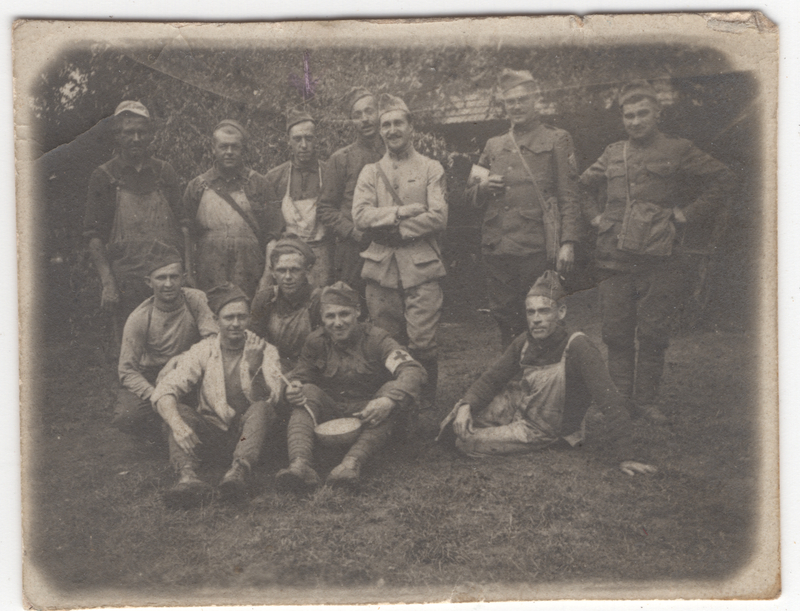 This photo (right) was taken with some of his (unidentified) fellow soldiers near Haute Alsace just after they arrived in France. Glenn sent it to his mother along with this letter in June 1918. He had participated in battles in the Aisne-Marne Campaign, the Oise-Aisne Campaign, and finally the Meuse-Argonne Campaign. Like many of the soldiers on the Western Front, my great-grandfather could tell that the war was drawing to a close, but was very anxious to see it finally end. Glenn and his unit were engaged in battle until the last hours before the Armistice took effect. He and his unit had indeed been up for two nights getting into battle positions and marching through tough roads. When the guns finally fell silent at 11:00 a.m. on November 11, I’m sure that the men were relieved that the war was over, and also in that moment, relieved that they could get some sleep. He wrote to his mother on Nov. 12, the day after the Armistice took effect, to describe his relief and his commitment to making the peace last.